The brilliant blue-green iridescent color of the incredible morpho butterfly from Brazil is produced by what scientists call “constructive interference” of light waves. An object has no color of its own. The color is in the light reflected by the object. Most objects show color by reflection and absorption. For example, the petal of a red flower has pigment that reflects only red and absorbs all other colors, so we see it as red. The morpho butterfly, however, has no pigment like the flower. The wing is made of a colorless protein called chitin, similar to that found in our fingernails. Instead of giving the butterfly its own color, God has designed a miraculous light-processing machine on its wing. 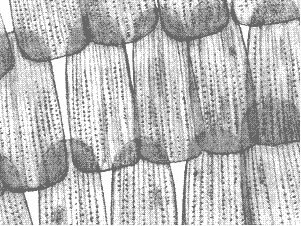 The wing has thousands of tiny scales (Figure 1), each covered with light filtering ridges shaped like Christmas trees (see Figure 2). Tiny layers called laminae (the limbs of the Christmas trees), which work similarly to diffraction gratings, produce the iridescent color. As light is reflected from the laminae, certain wavelengths are constructively reinforced, and others are cancelled out, producing the bright colors we observe. Figure 1. Scales of the Morpho Butterfly wing magnified 200 times. 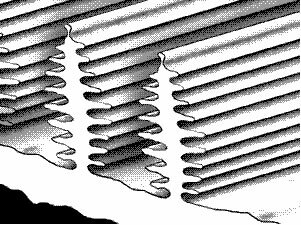 The spacing of the laminae must be precisely controlled to a certain fraction of the wavelength (1/8). Approximately 1.4 million layers of these laminae are meticulously arranged with incredible accuracy on the wings.There are 60-65 ridges (Christmas trees) per scale and 150 scales per centimeter on each wing. Figure 2. Cross-section of a scale showing the laminae that produce the iridescence of the Morpho wing. The actual color observed (ranging from violet to blue-green) depends on the path length to the observer. So each of us sees a slightly different color, depending our location relative to the wing! And, the morpho butterflies are such efficient processors of light, they have been observed by airline pilots at an altitude of 35,000 feet.